Take a break from Singapore with a short trip to Universal Studios Singapore in Sentosa Island, about 32 minutes away. 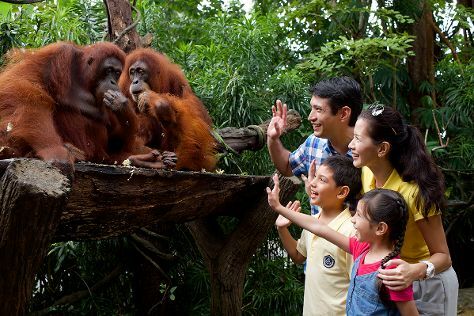 The adventure continues: admire nature's wide array of creatures at Singapore Zoo, wander the streets of Chinatown, admire the natural beauty at Singapore Botanic Gardens, and enjoy breathtaking views from Sands SkyPark Observation Deck. To find photos, maps, and more tourist information, go to the Singapore online tour planner . New Delhi, India to Singapore is an approximately 9-hour flight. You can also drive. Due to the time zone difference, you'll lose 2 hours traveling from New Delhi to Singapore. When traveling from New Delhi in May, plan for slightly colder days and about the same nights in Singapore: temperatures range from 38°C by day to 30°C at night. Finish your sightseeing early on the 13th (Mon) to allow enough time to travel to Mumbai. Go for a jaunt from Mumbai to Navi Mumbai to see Juma Masjid about 54 minutes away. And it doesn't end there: appreciate the history behind Gateway of India, enjoy the sand and surf at Chowpatty Beach, get engrossed in the history at Mani Bhavan Gandhi Museum, and snap pictures at Bandra-Worli Sea Link. For traveler tips, other places to visit, reviews, and other tourist information, read Mumbai trip itinerary planner . You can fly from Singapore to Mumbai in 9 hours. Other options are to do a combination of bus and flight; or drive. The time zone difference moving from Singapore Time to India Standard Time is minus 2 hours. In May, plan for daily highs up to 39°C, and evening lows to 31°C. Finish your sightseeing early on the 17th (Fri) to allow enough time to travel back home.